Us vegans…we get a lot of questions. A. 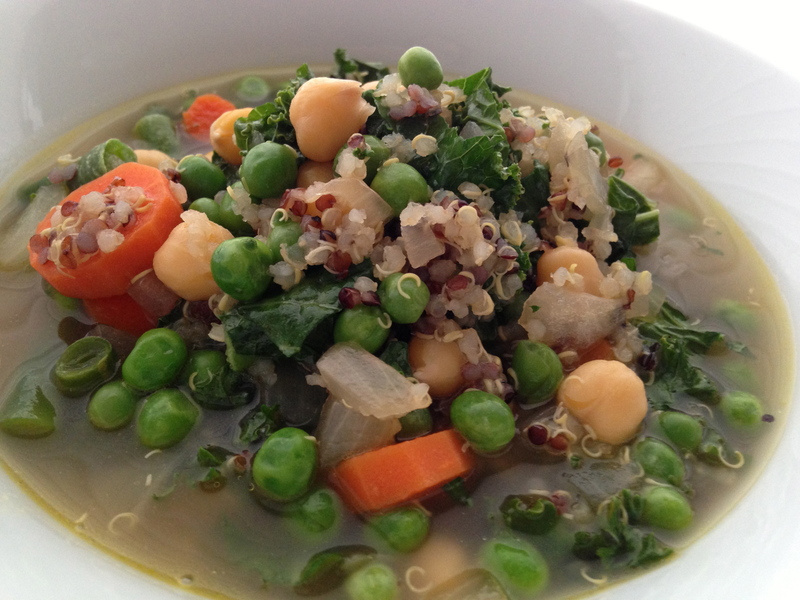 Iron rich plant sources such as kale, lentils, chickpeas, quinoa, peas, green beans. Q. Is being vegan difficult? A. No! Ok, maybe in the beginning, but once you get the hang of it, it’s easy! A. Yes, many dishes are already vegan. You just have to read or ask the waiter for the ingredients. When you want to cook for yourself, think about your favorite foods and figure out vegan substitues. For protein, think tofu or tempeh. For butter, think Earth Balance or oil. For milk, think oat milk, almond milk, hemp milk, or soy milk. For chocolate, think dark chocolate or look for the ‘v’ on the package. For ice cream, think dairy free! It is a matter of reeducation. Then it is easy! A. No! I can buy a pound of dried chickpeas for $2. And get 8 cups of cooked chickpeas out of it. That’s 8 meals such as chickpea salad, chickpeas and pasta, curried chickpeas, and chickpea stir-fry. A big bunch of carrots goes a long, long way. This soup answers all of the above. It is packed with protein and iron. And it is so easy to make, it is not even cooking. Price per bowl: < $1. Dice the onion and sauté in a soup pot in olive oil. Mince the garlic and add to the pot. Slice the carrots and add to the pot. Add the stock and bring to a slow boil. Add salt with each layer of vegetables. Add the green beans and cook until bright green. Then add the peas and cook for another minute. Finely dice the kale and add to the pot. Season with salt and pepper. Well written LD. I love this soup!